Dallas, Texas (December 29, 2011) – StockGuru Shines its Spotlight on Salamon Group, Inc. (OTCBB: SLMU). The Company announced yesterday that it has agreed to acquire 7.5M shares of Sunlogics PLC from an existing shareholder. The Company closed on December 28, 2011 at $0.06, trading in a fifty-two week range of $0.28 – 0.015. Dallas, Texas (December 23, 2011) – StockGuru Shines its Spotlight on Wescorp Energy Inc. (OTCBB: WSCE), a clean water technology company focused on implementing cost-effective solutions in several markets, including the oil and gas and marine industries. Yesterday the Company announced a status update. Throughout August and September, Wescorp engaged in discussions with two groups regarding the possibility of financing for continued operations. The Company closed on December 22, 2011, at $0.0040, trading in a fifty-two week range of $0.01 – 0.17. 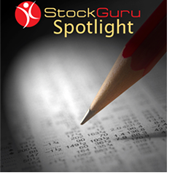 Dallas, Texas (December 9, 2011) – StockGuru Shines its Spotlight on Living 3D Holdings, Inc. (OTCBB: CCSG). The Company announced yesterday that it has acquired Living 3D Holdings, Ltd., a privately held company (“Living 3D”), focused on the marketing and sale of 3D image display devices in China. The Company closed on December 8, 2011, at $0.51, trading in a fifty-two week range of $0.51 – 0.50. Dallas, Texas (December 5, 2011) – StockGuru Shines its Spotlight on On December 1, 2011, Premier Alliance Group, Inc. (OTCBB: PIMO) as it enters into an Agreement and Plan of Merger with GreenHouse Holdings, Inc. (OTCBB: GRHU). Under the Agreement, GreenHouse would merge with a newly formed subsidiary of Premier and become a wholly owned subsidiary of Premier. GRHU closed on December 2, 2011, at $0.105, trading in a fifty-two week range of $3.00 – 0.06. Dallas, Texas (December 5, 2011) – StockGuru Shines its Spotlight on POWRtec International Corp. (OTCBB: POWT) an innovative California-based energy monitoring company. On Friday the Company commented on recent government initiatives in the UK. The Company closed on December 2, 2011, at $0.12, trading in a fifty-two week range of $0.40 – 0.04. Dallas, Texas (December 2, 2011) – StockGuru Shines its Spotlight on Titan Energy Worldwide, Inc. (OTCBB: TEWIE), a leader in distributed power generation products and intelligent energy management services. The Company closed on December 1, 2011, at $0.04, trading in a fifty-two week range of $0.40 – 0.004. The Company released yesterday the following shareholder letter from company CEO, Jeffrey Flannery. Dallas, Texas (November 30, 2011) – StockGuru Shines its Spotlight on Abtech Holdings, Inc. (OTCBB: ABHD) a developer and manufacturer of patented innovative environmental technologies addressing issues of water pollution and contamination. Yesterday the Company announced that it has completed the private placement of a $4.0 million bridge financing consisting of 12% Secured Convertible Promissory Notes (the “Bridge Notes”). The Company closed on November 29, 2011, at $0.45, trading in a fifty-two week range of $1.645 – 0.25. Dallas, Texas (November 29, 2011) – StockGuru Shines its Spotlight on Sunbelt International Inc. (OTCBB: SUNB), a progressive wind turbine solar panel hybrid company. The Company announced yesterday a corporate update with respect to its recent business activities. Over the course of the past 60 days, several meetings and presentations have occurred between Sunbelt International and various corporations and governmental agencies, both private and public. The Company closed on November 28, 2011, at $0.20, trading in a fifty-two week range of $0.20 – 0.001, and up 300 percent.